How would you like to spend your 200th birthday? Have you made any plans? Because time passes quickly, and your bicentennial might just sneak up on you. His baptismal certificate is not completely clear. He was either born on October 9, 1813 or on October 10, 1813. Just to be safe, I think we should celebrate all week long. After all, Verdi was one of the greatest opera composers of all time. He deserves a really fabulous birthday party. So I have developed my own live show called VERDI HEROINES. It’s quick romp through Verdi’s own dramatic life, punctuated by soprano arias from his best-loved operas. 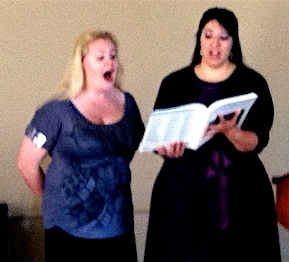 Just yesterday, I got to celebrate Verdi’s 200th birthday by singing “Verdi Heroines” for the South Bay branch of the Music Teacher’s Association of California, where I had the luxury of a very fine accompanist, Tomoko Ariyuki. If you’re in Southern California, please contact me (lindsay@lindsayfeldmeth.com) for more information about how to book my VERDI HEROINES concert for your private event. So how well do you know your Verdi? Operavore has provided this VERDI QUIZ to find out. If you were at my show yesterday, I really hope you get a good score. New York, NY ~ you can pre-buy tickets for the Met’s new production of Falstaff in December, but if you’re looking for a Verdi party in October, visit The New York Symphonic Arts Ensemble as they join with the Arcadian Chorale of Matawan to present Verdi’s Requiem on October 19. Sarasota, FL ~ Sarasota Opera has a genuine commitment to Verdi. They want to become the first opera house in the world to perform the complete works of Verdi! And they are on track to finish their Verdi Cycle by 2016. The company that calls itself “Verdi’s American Home” will be hosting a big birthday party on 10/10/13. Buon compleanno, maestro! 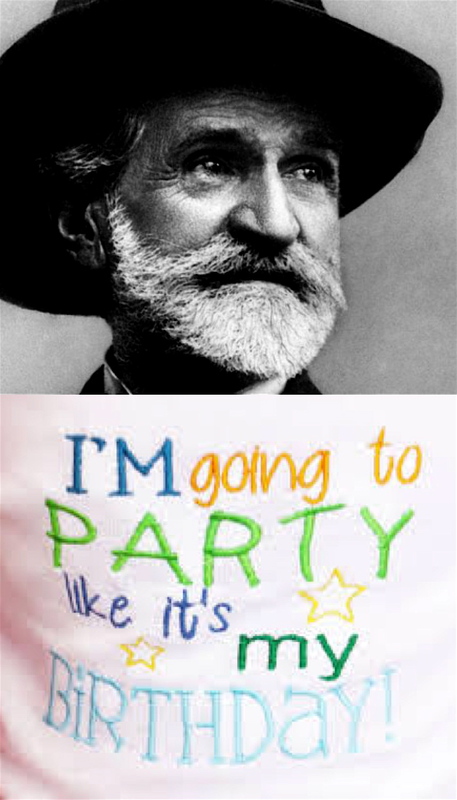 Viva Verdi! Sometimes it’s hard to believe that it really happened. The whole experience was so overwhelming that it took me a long time to even post about it. But here at last is a summary of this amazing, beautiful thing we got to do. 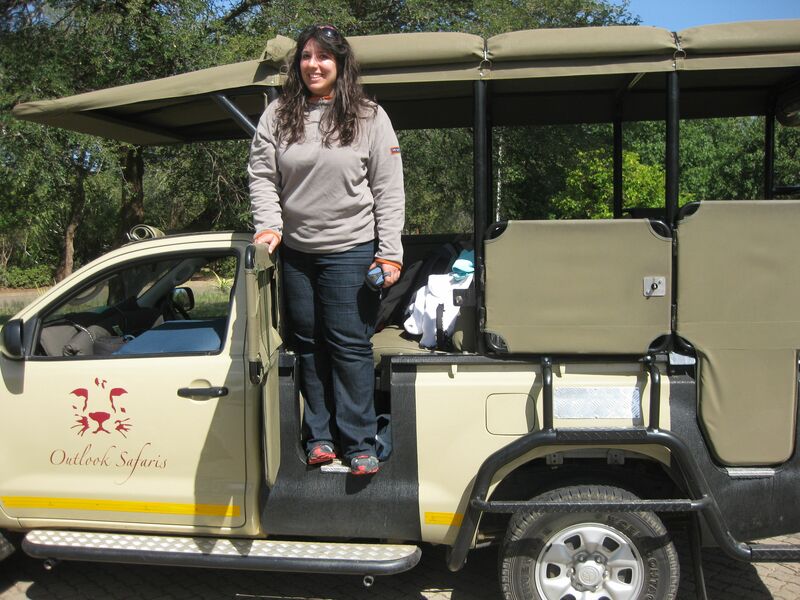 These are the highlights of our enchanted April in Southern Africa, where we launched the No. 1 Ladies’ Opera Festival. So what really happened over there? If you were following our hilarious adventures on Nani’s blog, or Bogdan’s blog, or here on the Globetrotting Soprano, then you know that we were never able to post as much as we wanted to post. There were power outages and bandwidth emergencies …. and the day our video footage got stolen by an angry baboon (just kidding) … Anyway, we couldn’t tell you the whole story. But now we can. 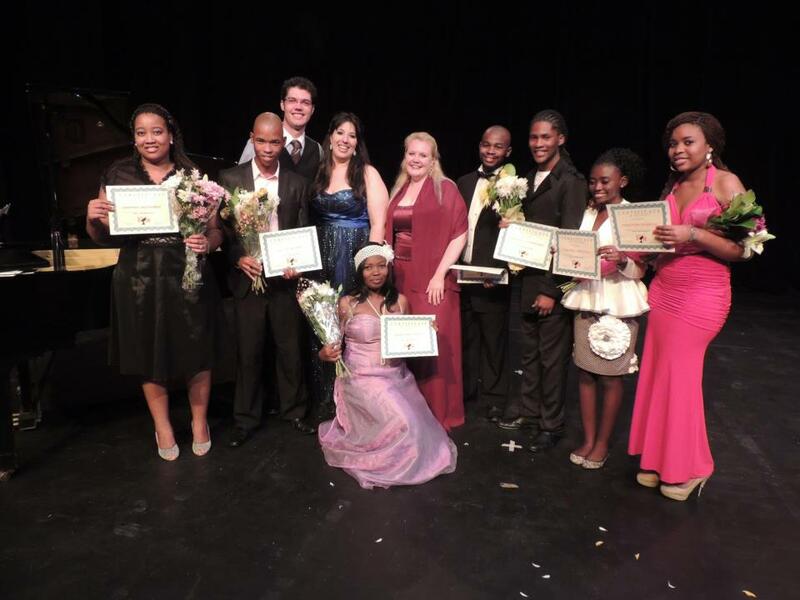 These talented young opera singers live and work in the capital city of Gaborone. If you’ve read the best-selling detective novels by Alexander McCall Smith, then you already know that Gaborone is a special place. But you may not know that McCall Smith also founded an opera house there! 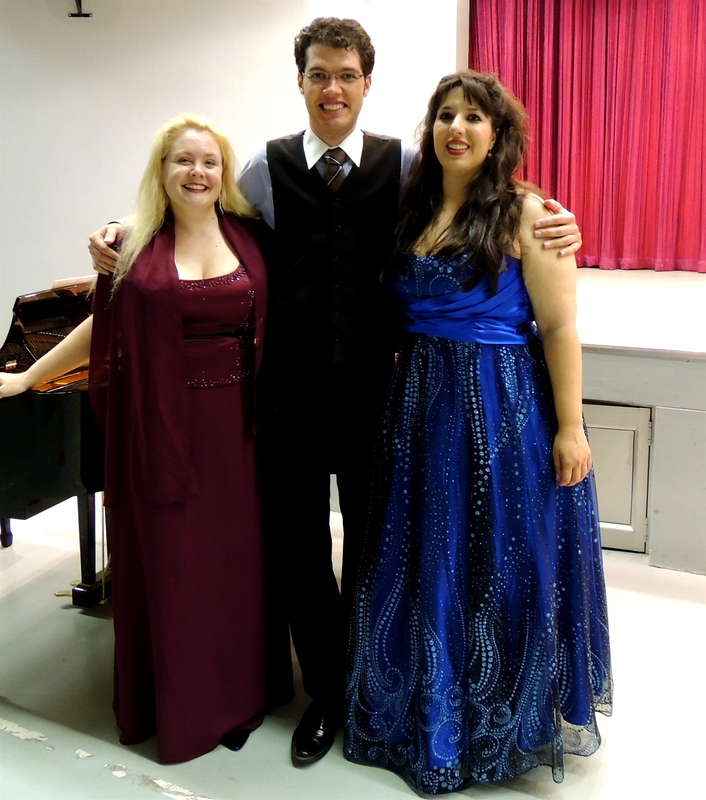 With the help of their coach David Slater, this group of singers had been performing full-scale opera productions at the No. 1 Ladies’ Opera House. In addition to showcasing their vocal talent, these productions were quite original in how they presented opera in the context of Afrocentric themes. But in December 2012, they lost their lease and Botswana’s only opera house had to close its doors. By establishing the No. 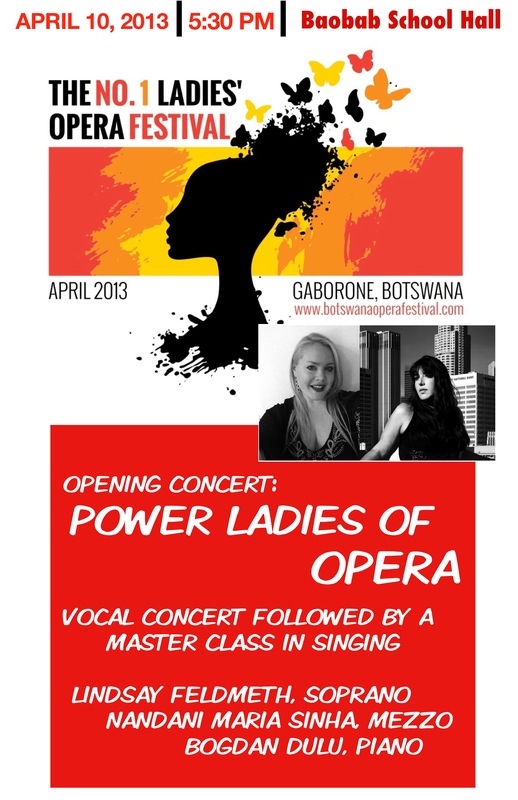 1 Ladies’ Opera Festival, we wanted to bring some momentum back to the opera scene in Gaborone. 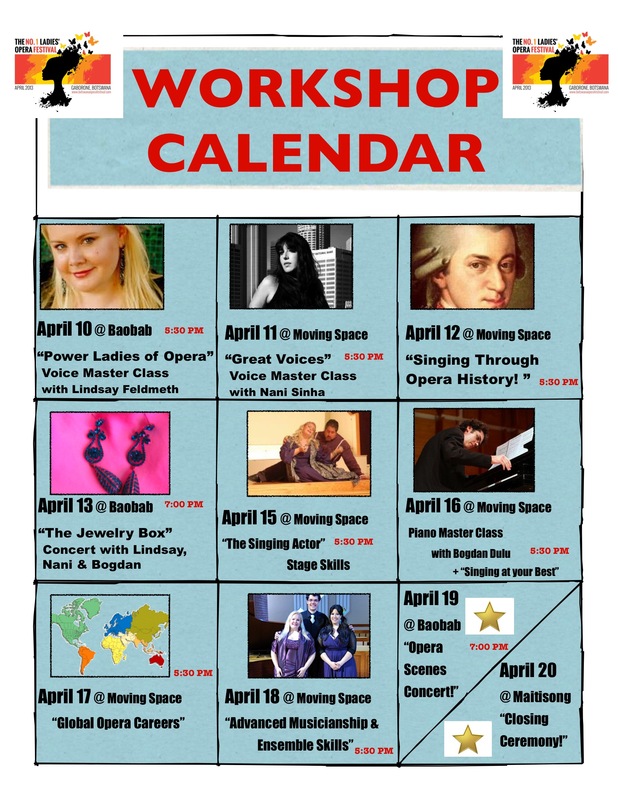 So we offered master classes in vocal technique, vocal repertoire, opera history, piano technique, acting, stage skills, musicianship, social media and career management. It was a labor-intensive two weeks, both for us and for our students! But we discovered some tremendous voices. We also had a wonderful time making music together. 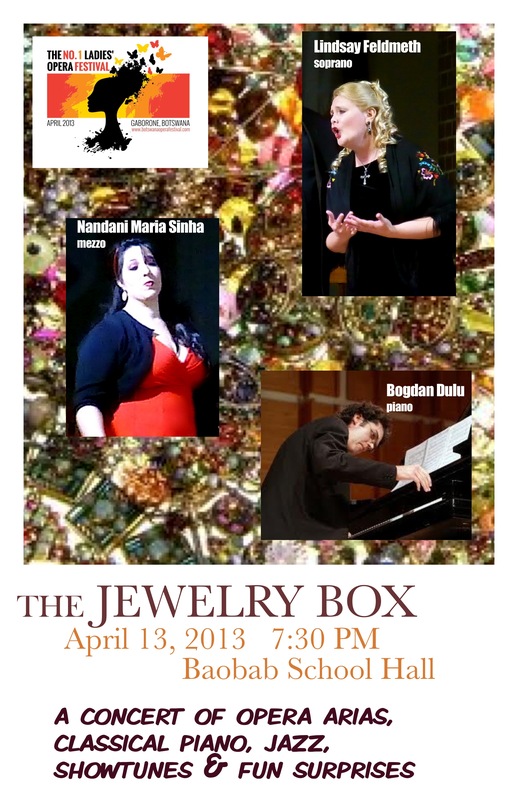 We presented two full opera recitals in Baobab School Hall, including both the Power Ladies of Opera (a show that Nani and I opened in Los Angeles in February) and The Jewelry Box, a recital featuring some of Bogdan’s virtuosity on the piano, as well as a lot of coloratura pyrotechnics from Nani and myself. 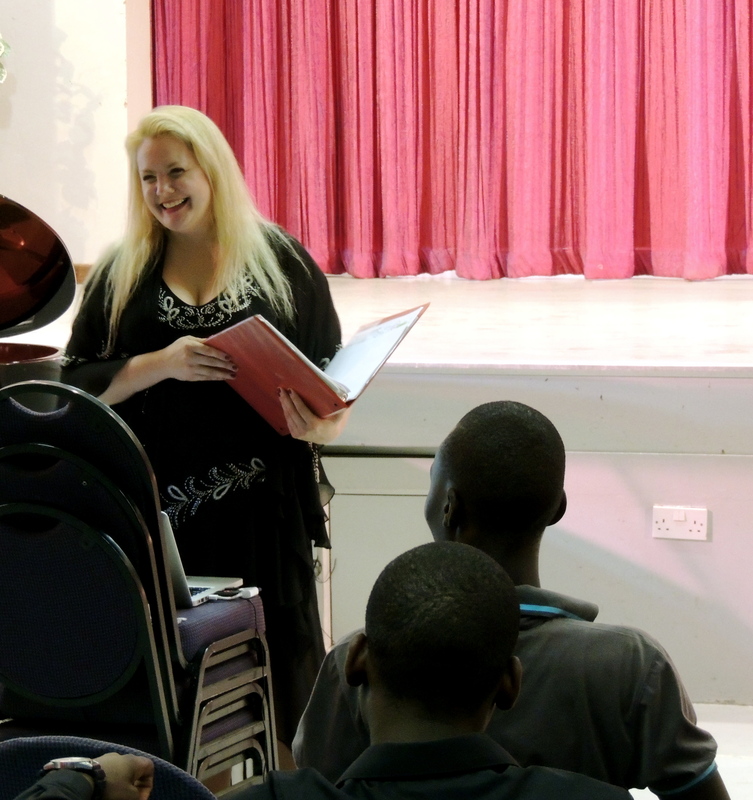 We also gave a guest lecture at the University of Botswana about empowering women through opera. 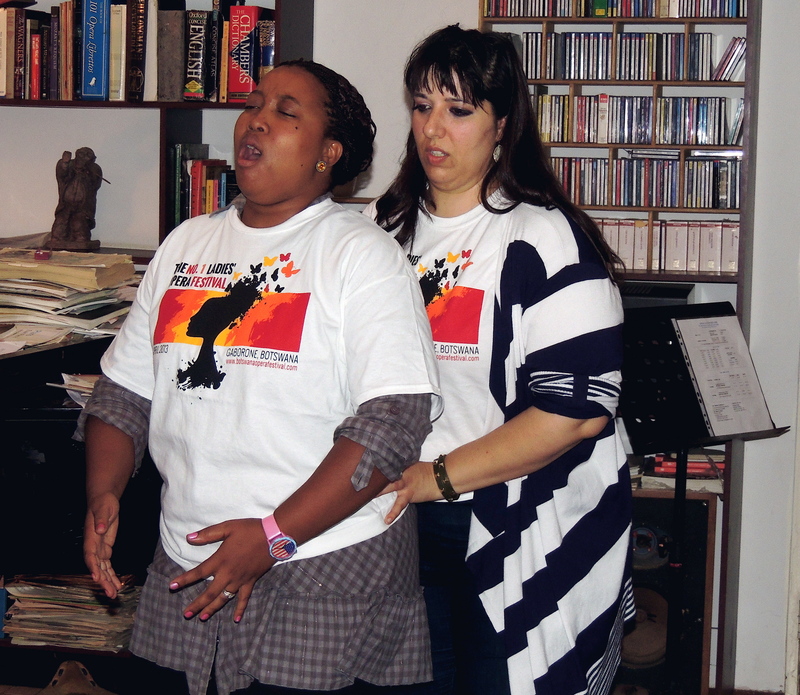 We performed some of our “Power Ladies of Opera” program and facilitated a discussion about gender issues in Botswana, and how European opera relates to the African female experience. But some of our coolest musical experiences happened at church! I’ve already blogged about the amazing church service where the congregation made my rendition of Mozart’s Alleluia into a call-and-response song! And where dignitaries from all over South Africa (including one Zulu king) came to worship God together in a huge white tent on a sunny Sunday in Rustenberg. Unforgettable. But I didn’t tell you about our church concerts in Cape Town! 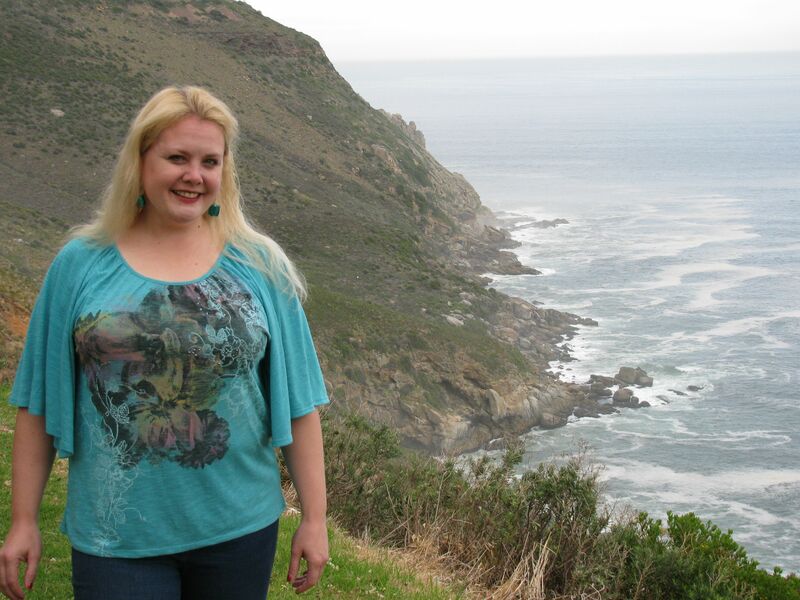 Throughout our time in Cape Town, we were hosted by the Global School of Theology. One of my sweetest memories is singing sacred music for a chapel full of energetic theology students. Later that day, we had the chance to sing at a benefit dinner for a recovery program for drug addicts. This successful program is run by Mt Hope Worship Centre in Mitchell’s Plain, South Africa, and they are doing some great work. 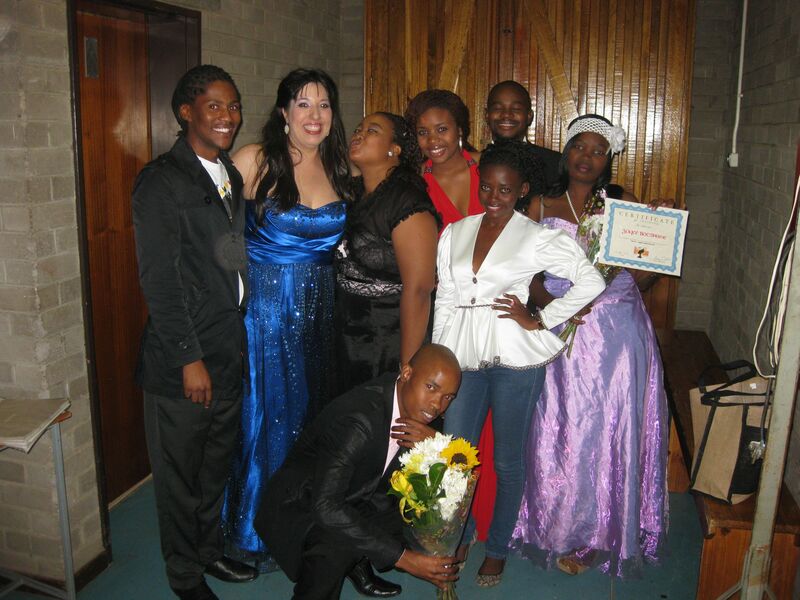 Meanwhile, back in Botswana, we got to participate in the closing ceremony of the Maitisong Festival, singing a few arias from Tosca and La Cenerentola before introducing the graduates of the No. 1 Ladies’ Opera Festival. 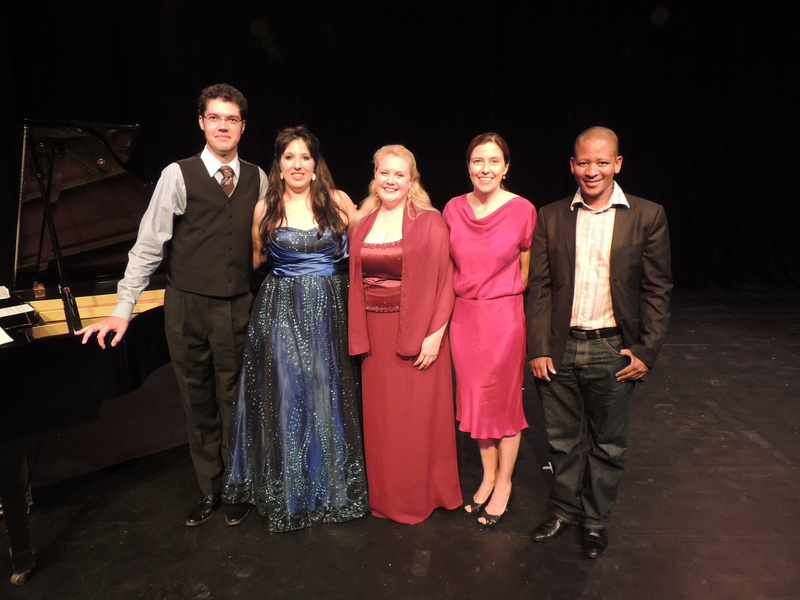 The concert was attended by the United States Ambassador Michelle Gavin. Ambassador Gavin said some very encouraging words that night about the importance of musical and cultural exchange between Botswana and the United States. Sadly, AIDS is still a terrible reality in Botswana. There have been great advances in drug therapies, and the government of Botswana is doing a good job with distribution. But that doesn’t solve the whole problem. 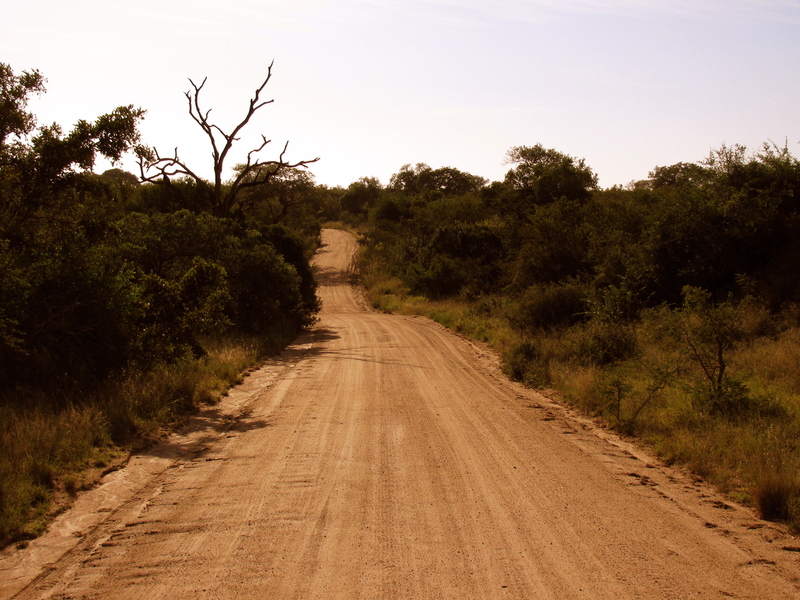 Some experts estimate that one third of the adult population of Botswana is infected with HIV. And the group most affected by HIV is women between the ages of 25 and 45. So as you can imagine, a lot of young children are losing their mothers. 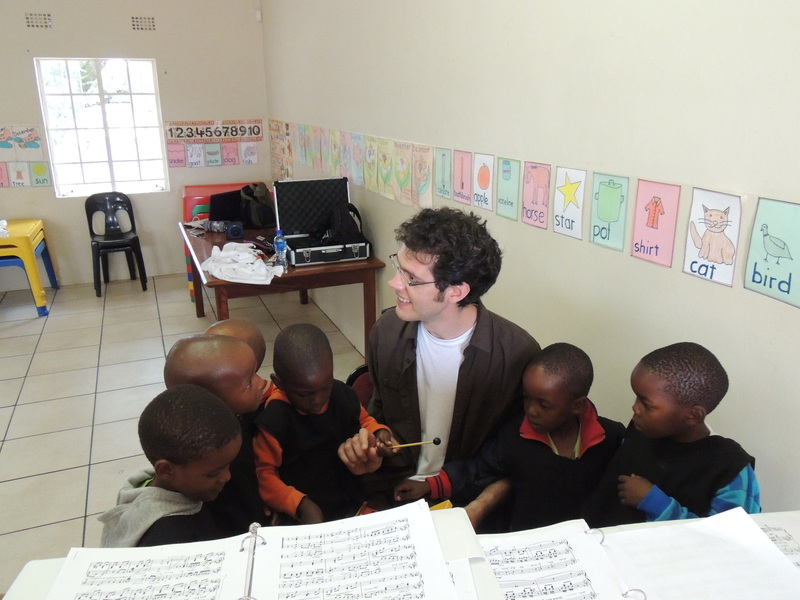 We decided to create a music workshop for AIDS-affected children (ages 2-6) in Botswana. Many of these precious children have lost their parents to AIDS, and some of them are HIV-positive themselves. But they are full of energy and just bursting with music! We collaborated with a certified music therapist to design our Joyful Noise! workshop. One morning, we traveled to the village of Kanye to play with 60 children at Kgodisong Centre. And then we spent three mornings at St Peter’s Day Care Centre to work with 76 at-risk pre-schoolers! 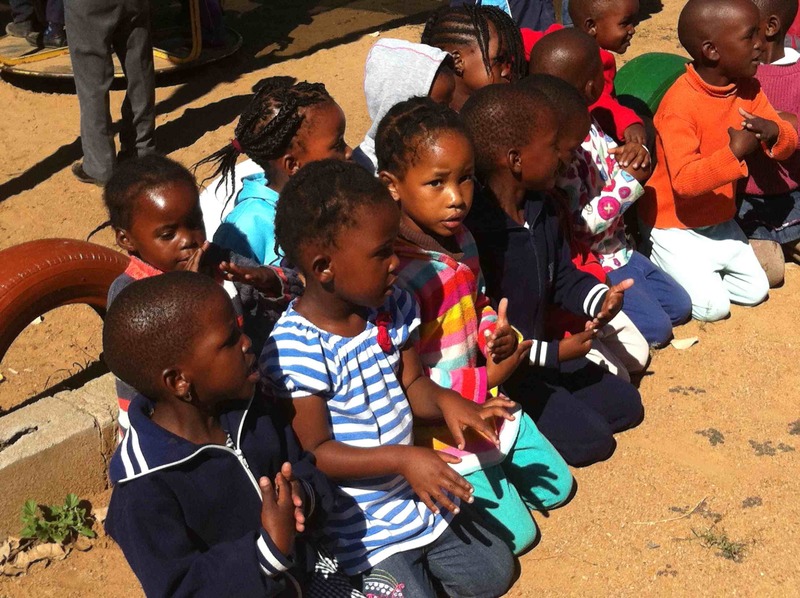 We wanted to give these precious children a fun-filled week of music games. 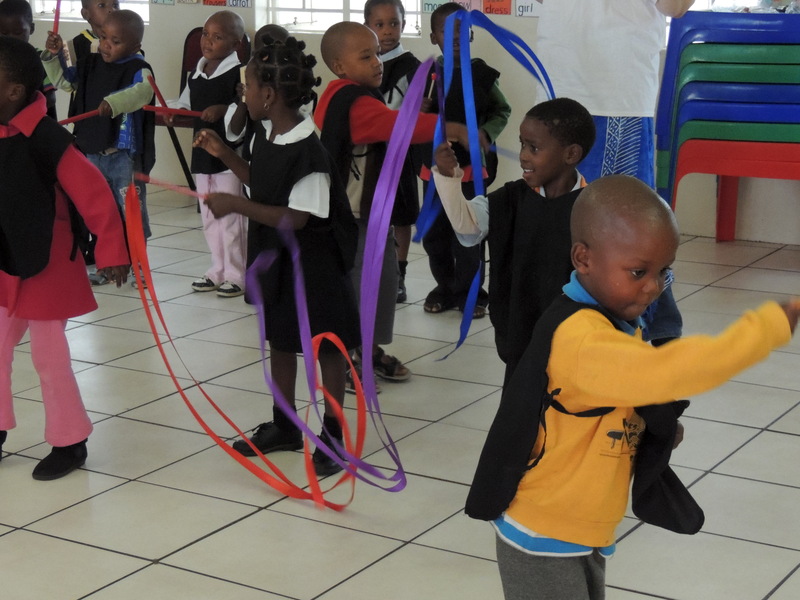 Some of our generous donors provided streamers and rhythm toys for the pre-schoolers in Mogoditshane. You should have seen their little faces light up when we gave them their presents. My sister and her family helped with this part of the festival. 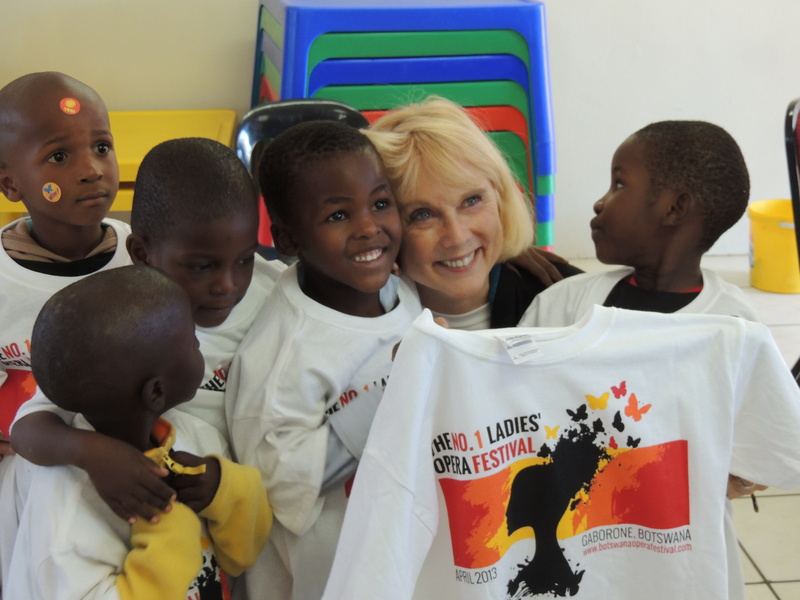 (They had spent the previous two weeks doing a special service project for orphans in rural Swaziland!) 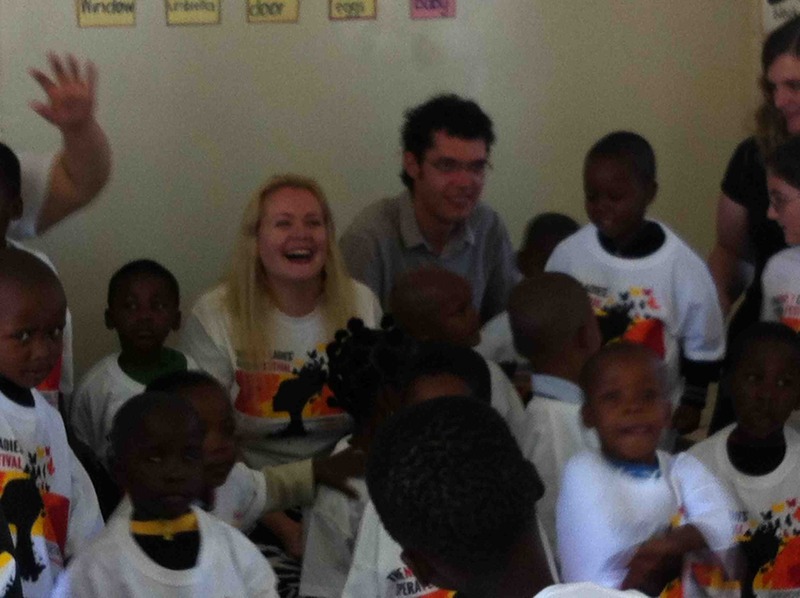 So my two nieces, ages 11 and 6, helped us play musical games with the Tswana children. That was a special joy for me to see!! Meanwhile, my mom was conducting some exciting academic research towards her master’s degree. As Vice President of Clubs & Mentoring at Royal Family KIDS, she directs a mentoring program for abused and abandoned children in the United States. While in Botswana, Mom arranged and facilitated a panel discussion with several African church leaders, authors and experts on the subject of “Church Response in Botswana to Children & Families Affected by HIV/AIDS.” She returned with some very interesting findings about the kinship care model of foster care. 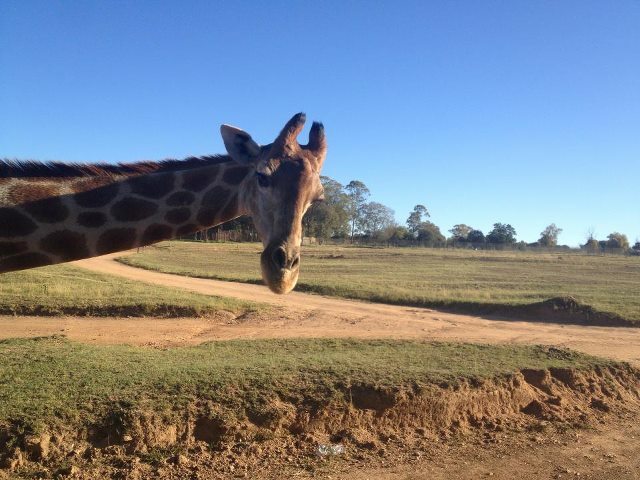 I’ve already blogged about Jackson’s Ridge, a beautiful campground in eastern South Africa dedicated to serving disadvantaged children. It’s the kind of place where you wake up in the morning to the sound of monkeys dancing on the roof of your cabin – pure fun. We met with Royal Family KIDS leaders at Jackson’s Ridge to discuss launch a mentoring club for abused children in South Africa in 2014! And we were able to make a very special donation towards a program called Jway Children’s Ministry. They train local churches in ‘child friendly’ outreach and education (40% of Africa’s population is under age 15), using puppets and magic shows to entertain kids from all backgrounds. When you’ve met these kids, you just long to bring joy to their little hearts. 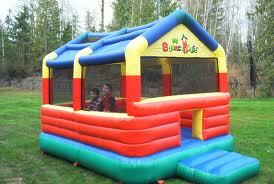 So we decided to donate our last money from the festival towards… a bounce house! This wonderful trip would not have been possible without the support of so many wonderful people. We want to thank David Slater, our chief musical collaborator in Gaborone! And Gao Lemmenyane, the director of the Maitisong Festival. Our sponsors: Association of Performing Arts Presenters, Water’s Edge Church, First Presbyterian Church of San Pedro, and Empower International Ministries. Our dear friend Karen Torjesen at Claremont Graduate University. And Professor David Kerr at the University of Botswana. And all of our singers… and all of the pre-school kids! Thanks to our dear friends Father Andrew and Gladys Mudereri at St Peter’s Day Care Centre. Also, our best buddies Charmaine and Donovan Manuel with J-WAY, and Neville and Gail Fannin with Royal Family KIDS at Jackson’s Ridge. And finally a big shout out to YOU, our faithful readers and supporters!!! We are in the process of making a documentary about the festival. Our brilliant videographer CAROLYN RAFFERTY got the whole thing on tape. So we have our footage already, but editing costs money. So there will be a Kickstarter campaign next month. Please consider donating. The world needs to hear the beautiful voices of Botswana! Thank you. 9. 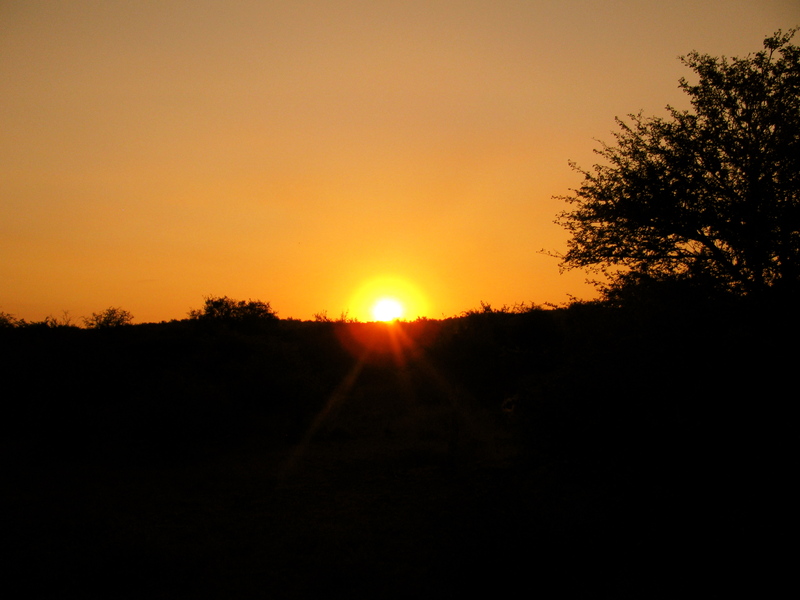 It’s impossible to get a photo that does justice to an African sunset… or an African sunrise. The orange-gold color is emblazoned forever in your mind, but not in your digital library. 6. When a monkey jumps in your car and steals your food, you start yelling at him, and you almost forget to grab the camera. 4. … but if you stop to blink, they’re gone. 3. The night shot you take of a baby elephant crossing the road with his mother in the moonlight doesn’t come out at all. So you have to use one from the daytime, which just isn’t as magical. 2. 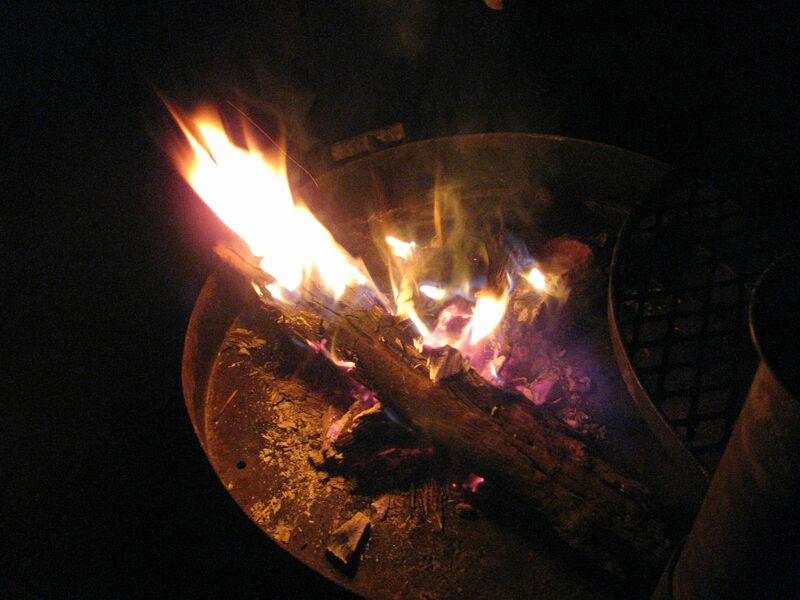 As you drift off to sleep, you can hear lions roaring, hippos grunting, crickets chirping, and hyenas laughing outside your tent — but no photograph in the world can communicate how it feels to hear those sounds, so you just take a picture of the campfire instead. 1. 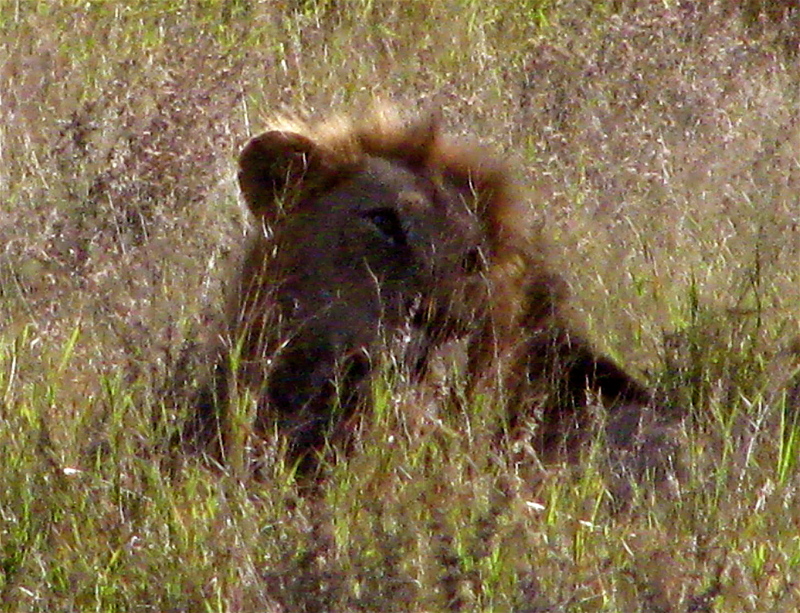 Then at last, after three days of waiting to see a lion, you suddenly catch this soulful expression from behind some tall grass… and you almost stop breathing! 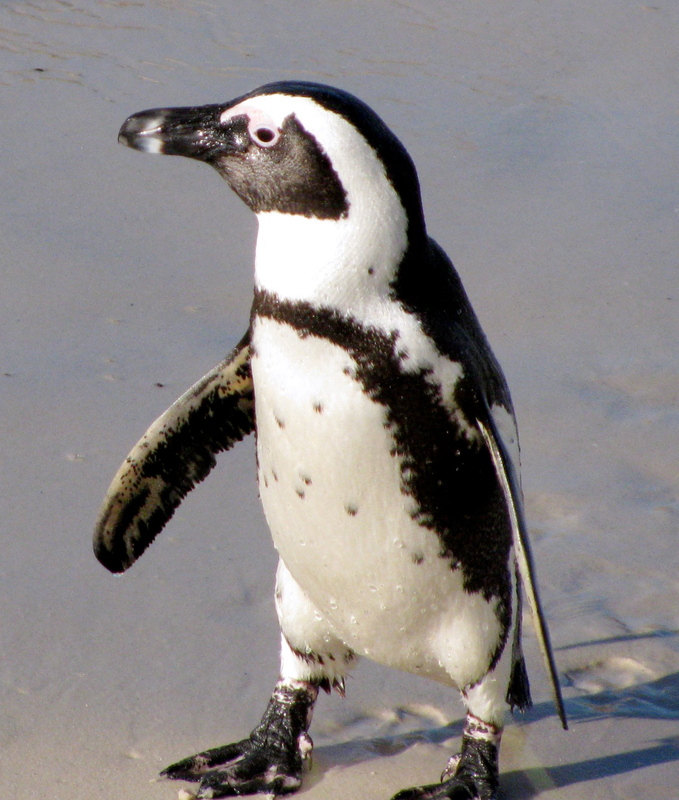 There’s just something about penguins. 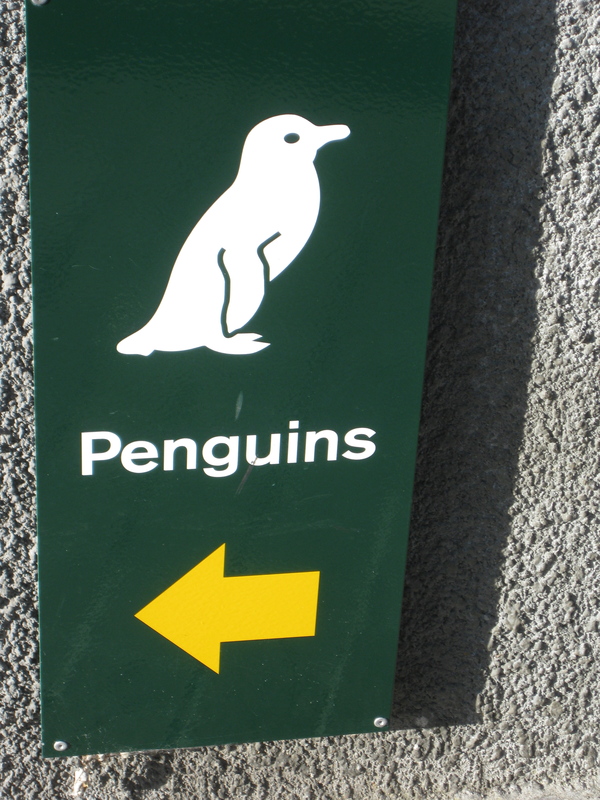 In her post, “the things you do for penguins,” Karen Jane Barlow describes the harrowing adventures she had in Tierra del Fuego — braving freezing temperatures and violent waves — in order to visit a penguin colony. 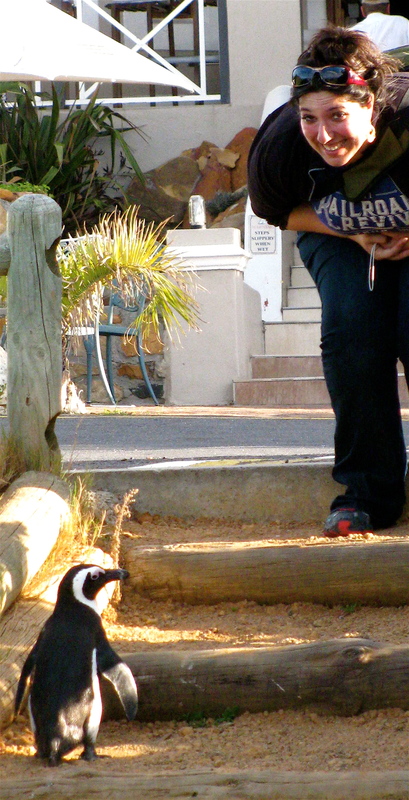 But even after that little kerfuffle, we still thought the penguins were adorable. (Nani is also very forgiving.) 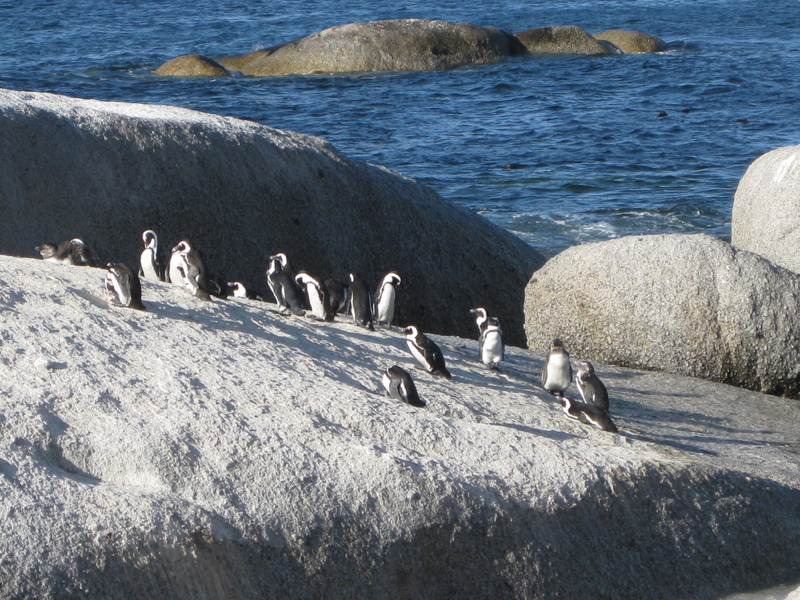 So if you ever get a chance to visit South Africa, go to the Cape Peninsula and watch the cute little guys scrambling around the granite boulders of Boulders Beach. Penguins are inspiring. After all, they do very well at the box office. Whether it’s the tap-dancing penguin from “Happy Feet” or the melancholy pilgrims in “March of the Penguins,” these little tuxedo-birds always capture the imagination. It was just a great day at the beach, and nice ending to our opera festival. I’d definitely do it again. 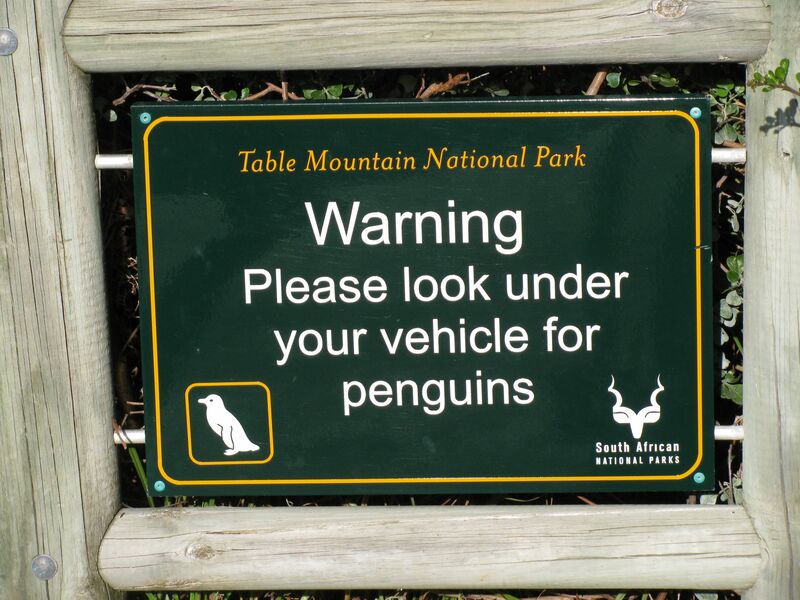 All for the love of penguins. 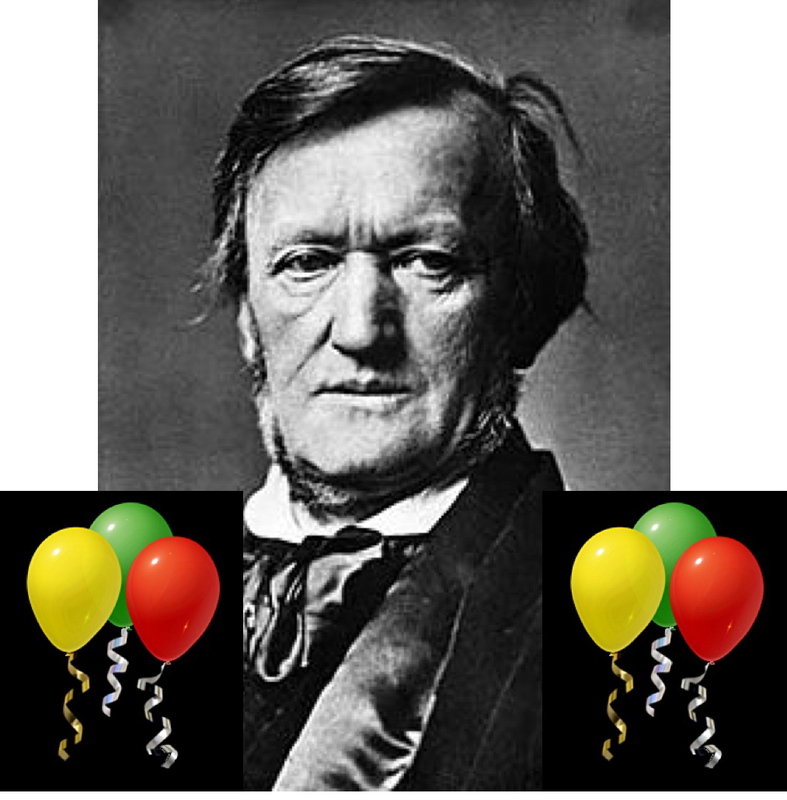 Today is Richard Wagner’s 200th birthday! To celebrate, I just uploaded my rendition of his song Traüme (“Dreams,” Op. 91, no. 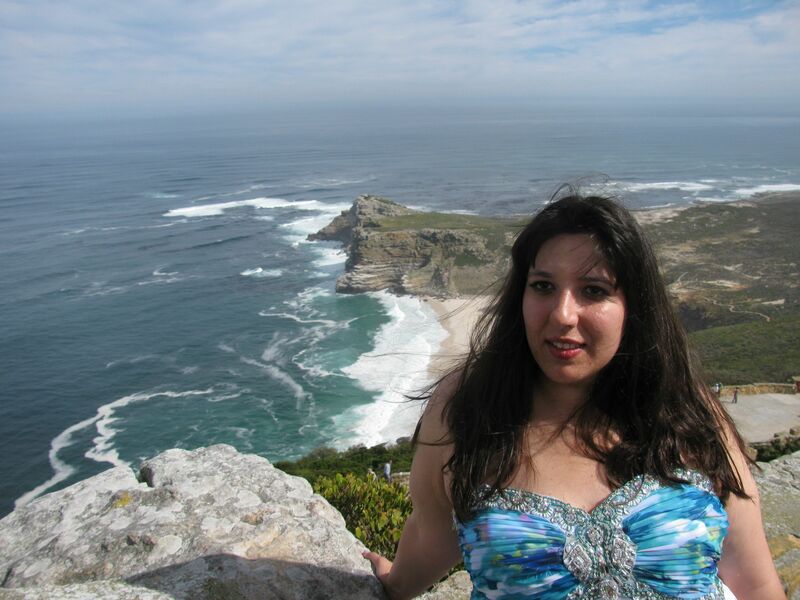 V) along with a slideshow of original photographs of Cape Point, South Africa. I hope you enjoy it. 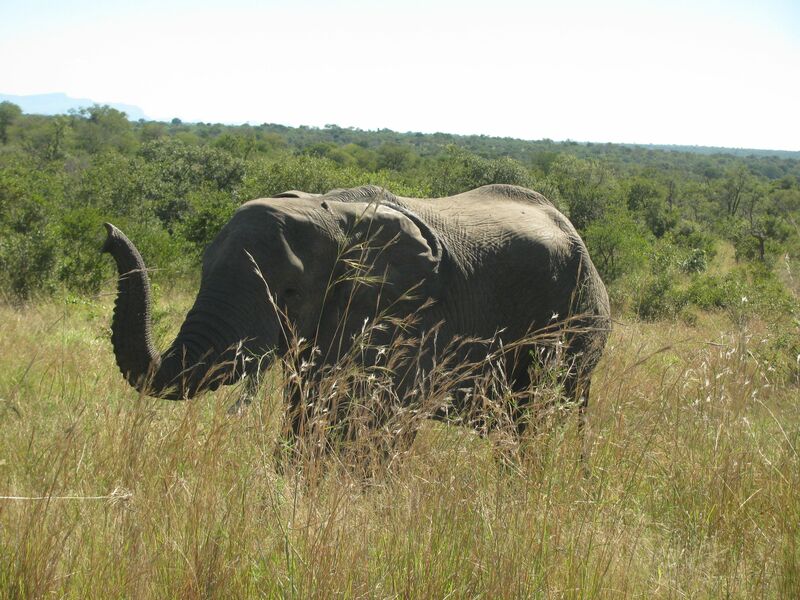 And please stay tuned for more posts about Southern Africa… coming soon! When I close my eyes, I can still see their little faces. It was hard to tear myself away from St. Peter’s Anglican Day Care Centre this morning, after three days of leading music workshops for AIDS affected pre-schoolers. They waved good-bye as we pulled out of the lot, still clutching the stickers and candy we had given them. Thanks to some generous donors, we were also able to give the children dozens of new music toys (claves, jingles, triangles, tiny cymbals, rhythm sticks, resonator bells, and colorful streamers for dancing). The kids were thrilled with their new instruments. When we have a faster internet connection, I’ll upload a video of the St. Peter’s Pre-School Band! (YES, Carolyn got it all on film!) These kids really know how to make a joyful noise! Earlier in the week, we also got to visit a very special pre-school in the village of Kanye. We sang praise songs with them, and played Vivaldi for them, and taught them to dance the hokey-pokey. They loved it. So we taught master classes (for adults) in the evening, but we spent our mornings singing and dancing with children between the ages of 2 and 6 years old! 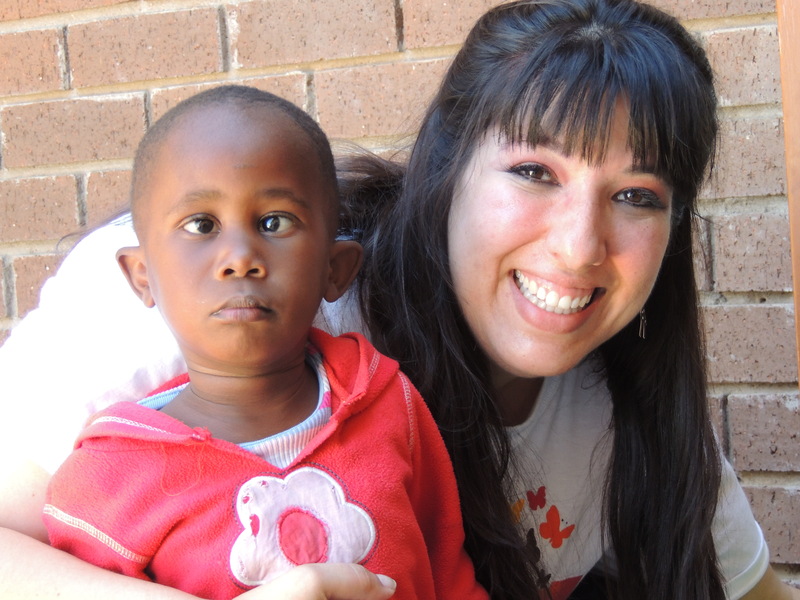 Both pre-schools are specifically for children who are affected by AIDS. Botswana has the second highest HIV infection rate in the world (behind Swaziland), and more than one-third of the adult population is HIV positive. There are sixty-four kids at the school in Kanye and seventy-six kids at the centre Gaborone, so we played with 140 pre-schoolers this week! Some of these little ones are HIV+, and others have parents who are sick (or have already passed away). And some of the children are not directly involved with AIDS, but they have been victims of abuse or neglect. They are all hungry for love and attention. And they all love to sing and dance! I also had a lot of support from my family! My sister and brother-in-law and their two daughters drove up to Botswana on Tuesday, after completing a service project in Swaziland. They came to help with the music workshops at the pre-school, and I was so excited to have them with us! 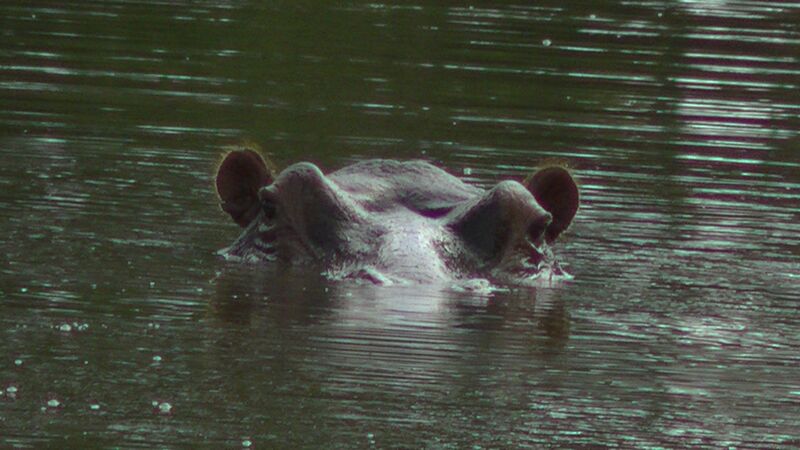 You should have seen the Tswana kids’ faces when they saw my two nieces (ages 6 and 11) come into their classroom. It’s an amazing thing to watch kids from vastly different cultures trading their favorite songs and dances. Such fun! My mom helped coordinate the entire effort at both pre-schools. She located both facilities, and she interviewed several local experts on AIDS, because she is currently researching the response of the African Church to the orphan crisis. We met several people who inspired us – they are passionate about caring for at-risk kids, and they have dedicated their lives to serving these precious little ones. By the end of the week, the kids were clinging to us like Velcro! We were getting innendated with hugs. But it was wonderful, because they are adorable and huggable kids. We’ll miss them. 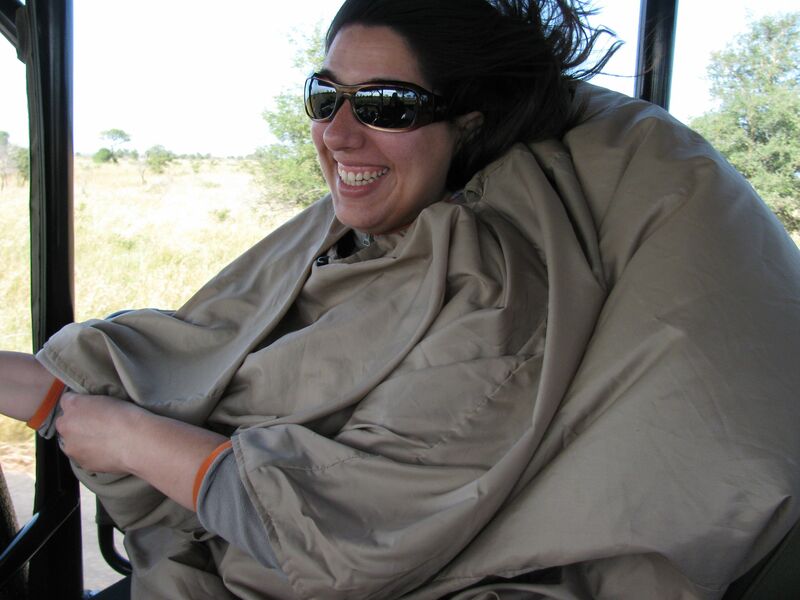 Meanwhile, we have had many other adventures here in Botswana, and I just haven’t had time to tell you all of the wonderful (and crazy) things that have happened to us. So once again, I will direct you to Nani’s blog and Bogdan’s blog because they’re both touching and hilarious. Please stay tuned for more news about our final concerts! I just can’t believe the No. 1 Ladies’ Opera festival is almost over. It’s been unforgettable. There are some sounds that knock you sideways. The vocal talent in Botswana is simply phenomenal. 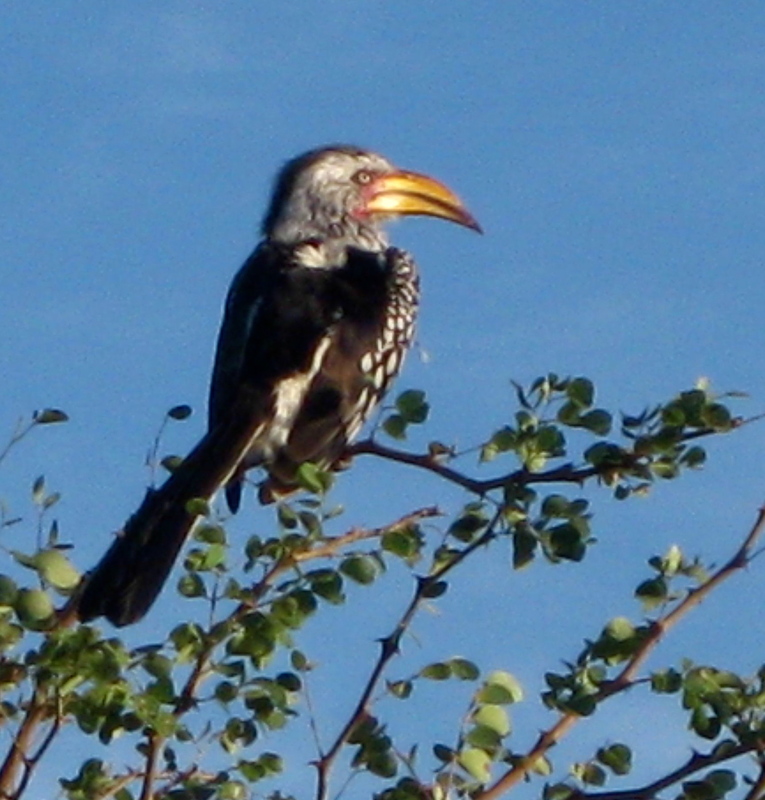 For someone who craves the sound of rich and resonant voices, Gaborone is like a candy shop. As you can imagine, the master classes that we are teaching are just as much fun for us as they are for our students! Our young singers are very modest and unassuming; sometimes, they are so shy that it is hard to coax them to sing. But when they open their mouths, the music just pours out of them! More than a few times, Nani and Bogdan and I have been left a little breathless by the quality of the sounds we hear. We have even met a few voices that (if they get the proper training) might someday sing in the great opera houses of the world. But like all young opera singers, they need rigorous training in order to make that dream a reality. And it is hard to get the necessary education in a country without a single music conservatory. Despite the enthusiasm of the singers themselves, Botswana’s audience for classical singing is still fairly small. On Wednesday evening, we opened the No. 1 Ladies’ Opera Festival with a concert on the theme of “powerful women in opera.” Four dozen classical music lovers filed into Baobab School Hall, curious to hear an opera concert in Gaborone. There has been no opera here since December, when the No. 1 Ladies’ Opera House was forced to close because they lost their lease. With Bogdan at the piano, Nani and I sang some of the great operatic showstoppers by Mozart, Bellini, Rossini, Bizet, Verdi and Wagner. And it was a success! At the reception that followed the concert, the audience showered us with compliments, calling the show “spectacular” and “immensely enjoyable.” We heard so many kind words from local music teachers, music enthusiasts, tourists, and even from a representative of the United States Embassy! We felt honored to be able to perform for such an appreciative public. But that was just the beginning. After the reception, we invited the young opera singers back into the theater, where I taught a master class in vocal technique. The students were brimming with energy: they studied my powerpoint slides about the lungs and the vocal cords, and they listened carefully to my sound clips of great singers, and they immediately integrated my vocal exercises for breathing and support. Then, one by one, they came up to the front and sang for us. Many of them actually seemed quite nervous about this, but with the support of their friends, they gathered enough courage to come forward. They tentatively handed Bogdan their music and introduced themselves. Some of them were so shy that they actually hid their faces behind their hands. But then they blew us away with soulful renditions of “Un bel di vedremo” and “Nessun dorma!” It was the most amazing experience. The very next night, they all returned to hear Nani’s master class on acting and audition skills (and vocal technique, too!). For me, it was such a joy to sit back and watch Nani teach – it is just so gratifying to watch her give these singers the tools they need to improve. And I can’t wait to see Bogdan’s master class on Tuesday! These students are so hungry to know more about singing. Then last night, I gave a short presentation on the history of opera, and challenged them to think about Botswana’s place in the FUTURE of opera. They smiled thoughtfully, and then they went right back to work, singing their hearts out. We are hoping that our festival will bring some national and international attention to these marvelous singers. We will be featuring these voices in YouTube clips. There are some Tswana voices that you will want to hear. 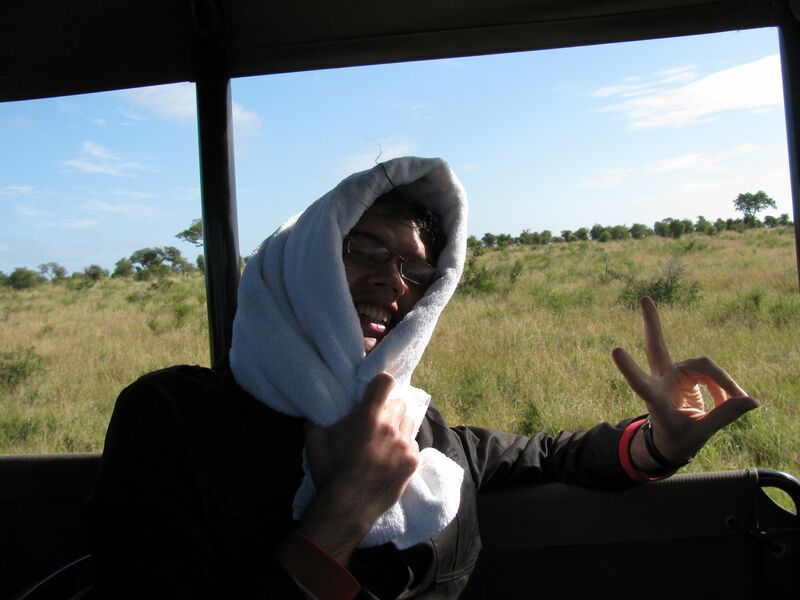 Meanwhile, be sure to check out Bogdan’s blog and Nani’s blog for more about our exciting adventures in Botswana! 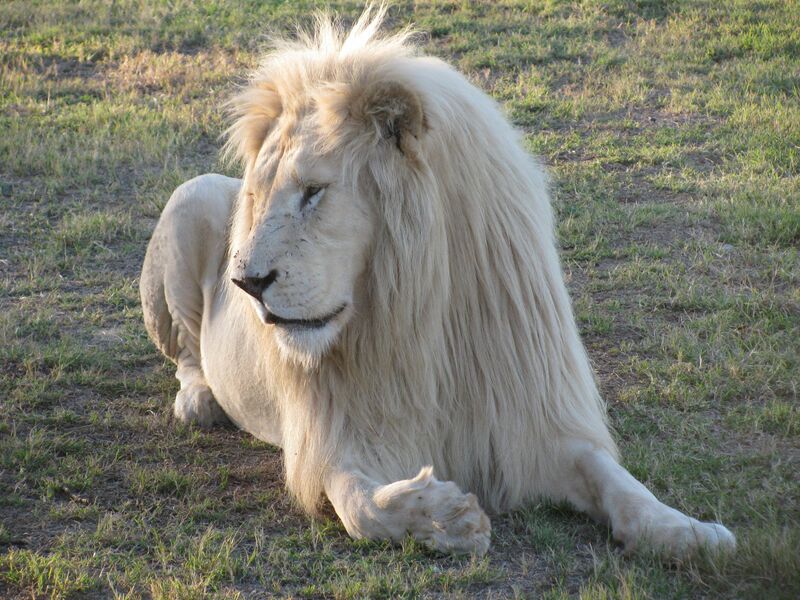 There is a magical place near Magdaliesburg, South Africa, and it’s called Jackson’s Ridge. It’s a campground for abused and neglected children, and it’s run by some wonderful friends of mine. 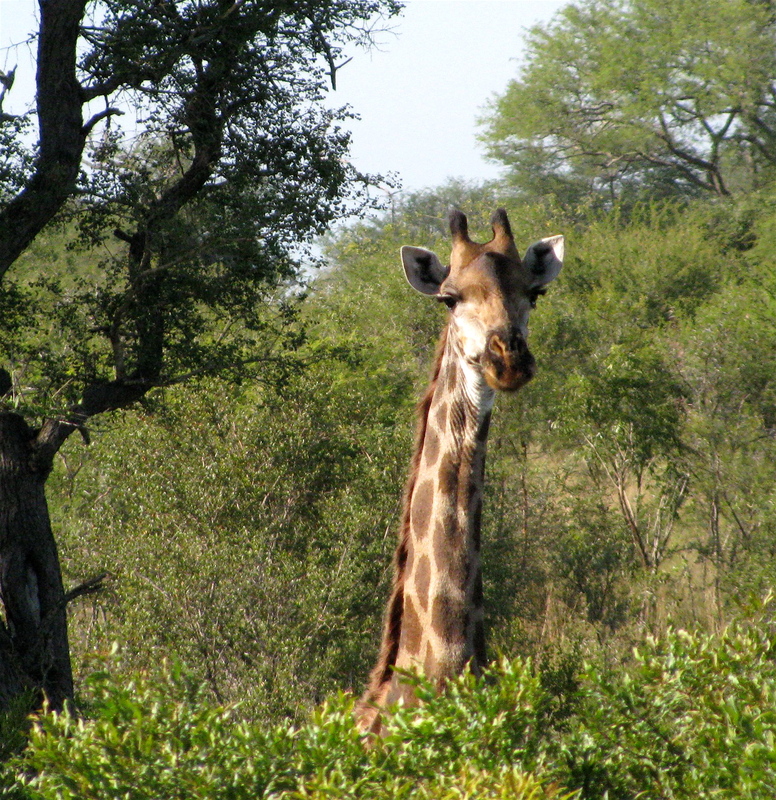 The campground is full of beautiful vistas and it is teeming with wildlife. 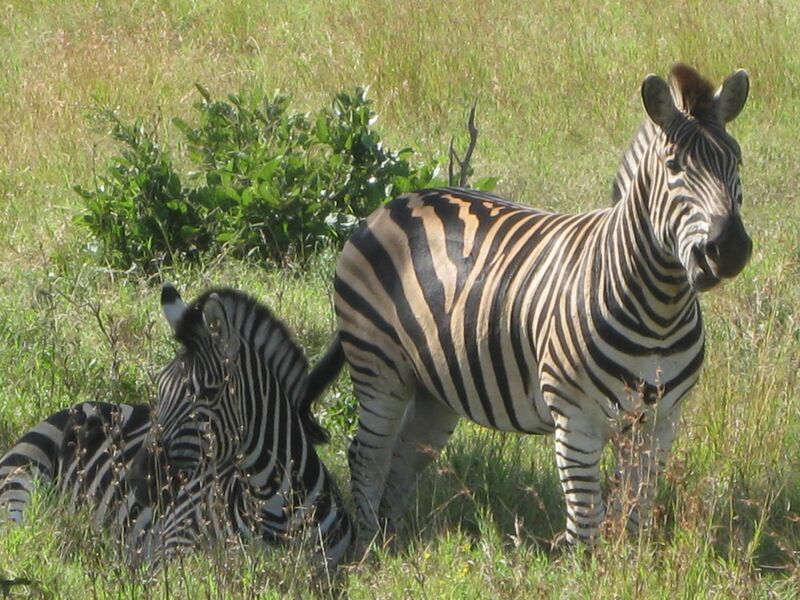 It’s an African paradise! 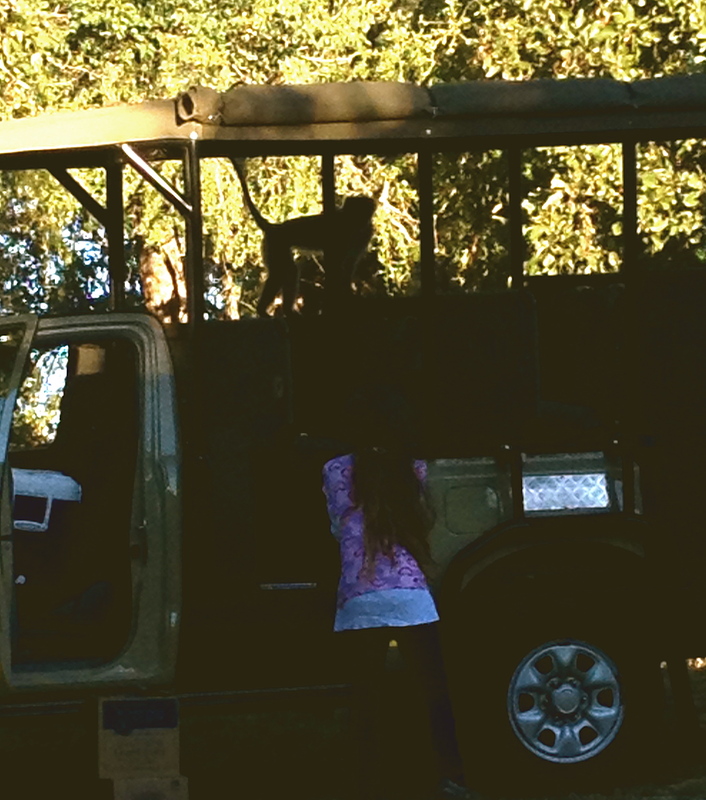 We arrived here Saturday in time for a South African braai (barbecue party). We indulged in some delicious traditional foods while trading stories with our friends. The next day, we went to a worship service at the Excellence Christian Centre. And it rocked! The church was inaugurating a brand new chapel, and the service took place in a huge tent right on the building site. People came from far and near to help celebrate.There were several visiting dignitaries, including His Majesty, King Motlotlegi Kgosi M.E. Molopyane Mabe! At the end, the pastor asked us to learn a song in Zulu to take back to the United States. We joyfully accepted this commission! Then I got to sing Amazing Grace a cappella while the congregation filed out of the tent and walked into their brand new chapel for the very first time. What a beautiful moment. 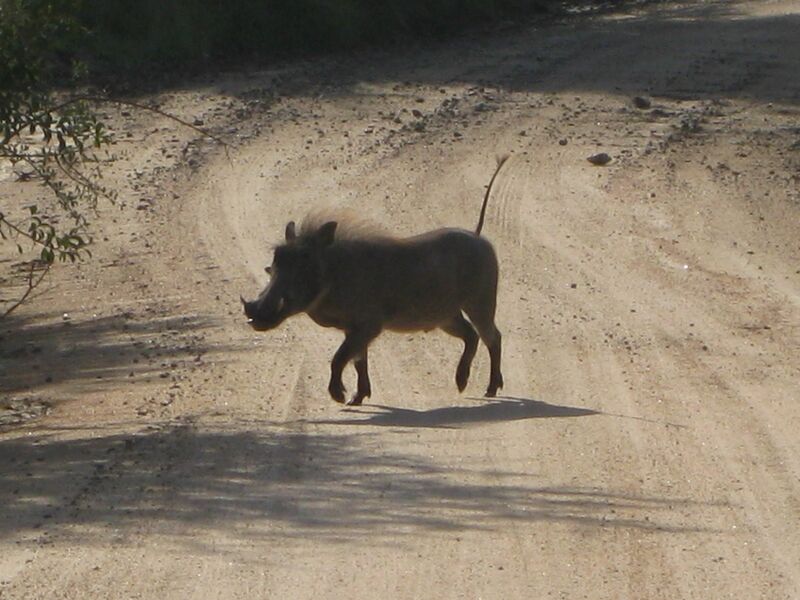 The airport in Johannesburg was not quite what I expected. From what others had told me, I was bracing for an atmosphere of controlled chaos, like the international terminal at Moscow’s Domodedovo Airport. But my information was seriously out of date. The O.R. Tambo airport is clean and bright and efficient, featuring high-end shops like Gucci and Montblanc. It feels just like dozens of other international airports across the world; the only sign of Africana was a large plastic elephant in one corner of the concourse. The team of the No. 1 Ladies’ Opera Festival traveled in two separate groups. 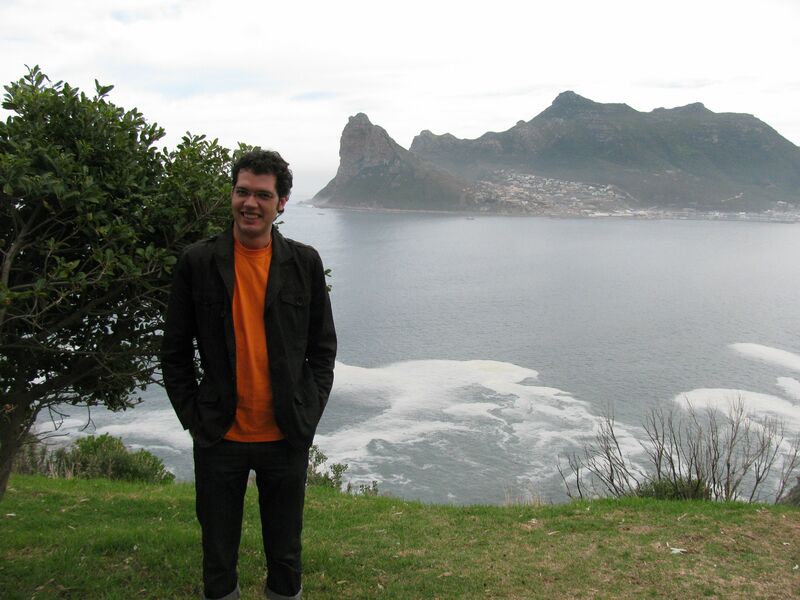 Bogdan Dulu, our star pianist, was flying on his own from Vancouver to Johannesburg. But I was traveling with Nani Sinha, our fabulous mezzo, and my mother, who is helping to coordinate the music program for AIDS orphans in Gaborone. 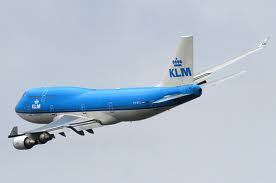 Weflew from Los Angeles with KLM Royal Dutch Airlines (or, as I like to call them, “the Flying Dutchmen.”) The seats were a bit cramped, but there was a wide selection of movies (including a performance of Aida conducted by Zubin Mehta) and copious amounts of airplane food. We spent twenty-one hours in the air, not including a dangerously tight connection in Amsterdam. I slept most of the journey, but fortunately I was awake to see the sand dunes of the Sahara Desert from 30,000 feet! Meanwhile, Bogdan had a very different experience on British Airways — on his way from Canada to South Africa, he managed to spend a snowy day in London! When we finally met up, it was almost midnight in Joburg, but we celebrated the beginning of our festival by going out for pizza. To our delight, we discovered that the pizzas at Cappello Pizzeria were named after world leaders! Check Nani’s blog if you want to know whether we liked the Obama pizza better than the Mandela pizza. After the global-leader-pizza-party, we called it a night. There is much to do in the next few days. After eleven months of planning, the NO. 1 LADIES’ OPERA FESTIVAL is about to begin. My music team is more than a little excited. 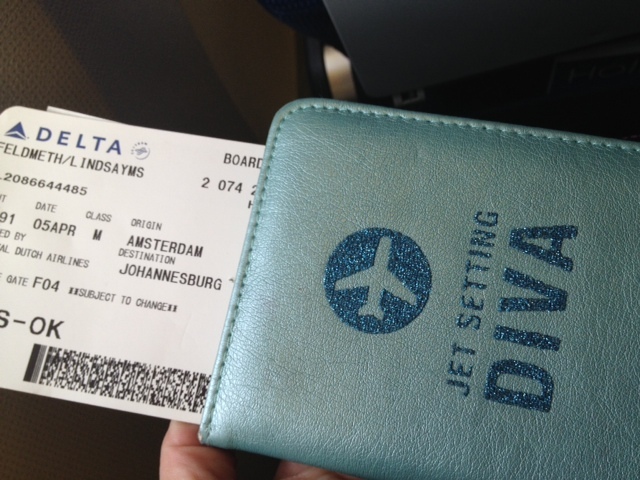 Our flight to Johannesburg (via Amsterdam) departs in just a few short hours. 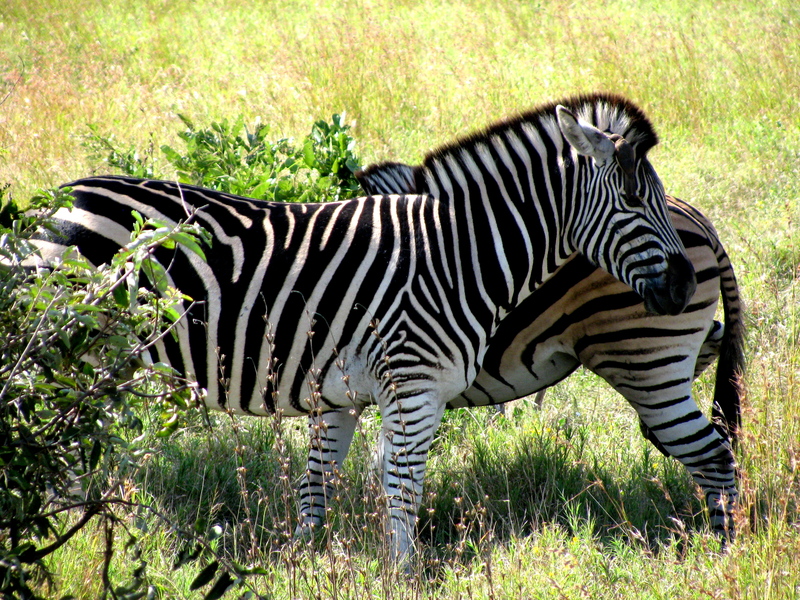 We can’t wait to experience the sights and sounds of Southern Africa. And we’re especially excited to meet the singers of the No. 1 Ladies’ Opera House in Gaborone, Botswana. We’ll also have the chance to share our music with some AIDS-affected kids. And we’ll be visiting some friends along the way. Stay tuned for photos, stories, audio and video clips of our adventures! Where can you find these updates on our progress? Right here! This is where I’ll be posting my news. And if you’re still hungry for more festival news, read Nani’s updates and Bogdan’s updates! And of course, you can join our festival Facebook page! Are you ready? It’s time to get launched!